Wolfhounds are quite lazy and will quite happily snooze for 18 hours a day. 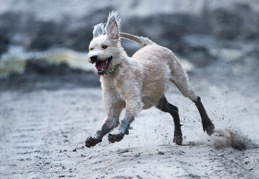 On a large property wolfhounds effectively self-exercise through play (see above). For a small property, a walk twice a day is preferable and for a flat four times a day. It is most important not to over-exercise puppies for the first year as their joints are still soft and over-exercise can bring on hip and/or elbow dysplasia. Because of the risk of bloat/torsion do not exercise wolfhounds immediately before or after feeding.